The Quilt Study Group has arranged a guided tour for Quilt NSW Guild members to The Opera Centre – Surry Hills, Sydney on Monday the 27th of May. Because there is a limit of 20 people, please ring the Guild office before Friday the 24th of May to reserve your place. The cost is $20 per person, payable on the day to the Opera Centre. 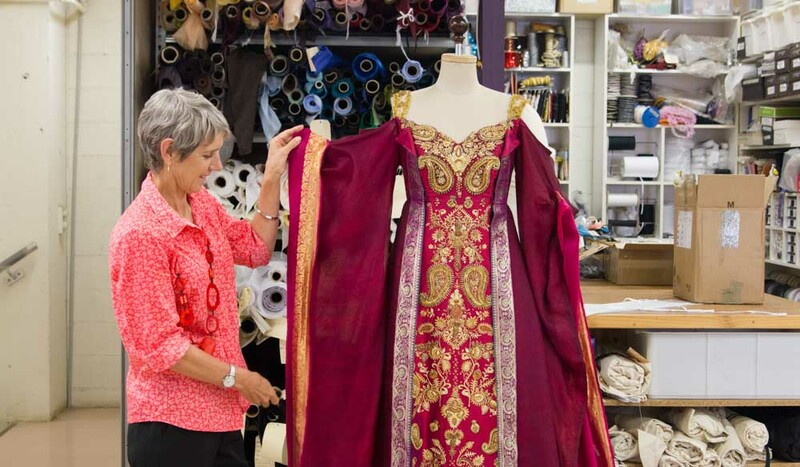 The Opera Centre is where the costumes and sets for Opera Australia are made and stored and we will see the vast production workshops and rehearsal studios. People from many disciplines (milliners, wig makers, cobblers, costumiers, designers, carpenters, model makers, and scenic artists) work to stage the operas and we will see examples of their work. 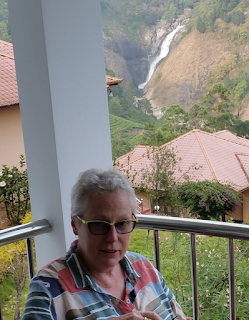 Participants must have a good level of fitness for this walking tour. It includes many stairs and there are no passenger elevators. 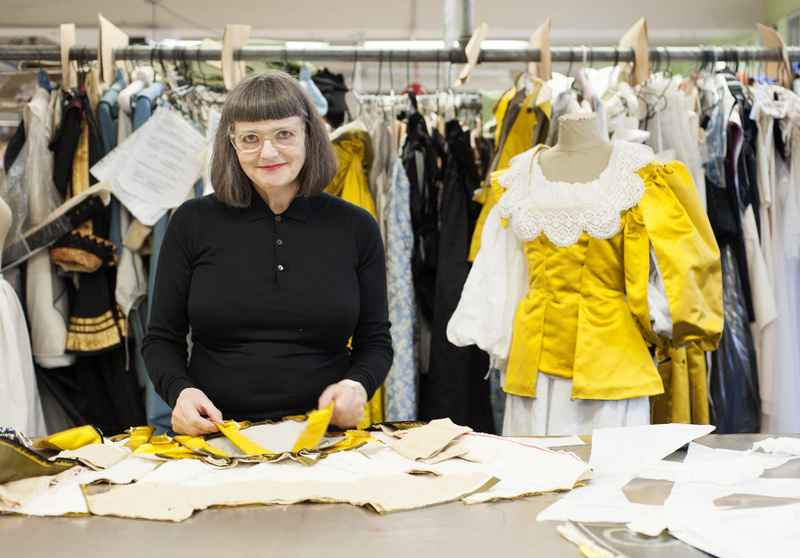 The Opera Centre is a 10-minute walk from Central Station (take the Chalmers Street exit). Please assemble at the Tour Meeting Point 15 minutes prior to your scheduled tour start time of 10am. The tours take approximately 90 minutes. 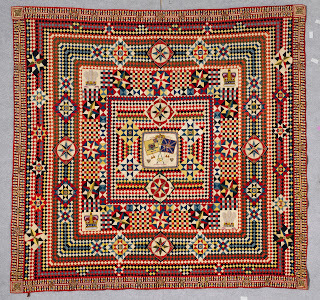 To showcase our beautiful quilts, and to keep your quilts safe, we need your help. 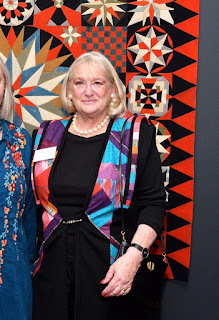 Please consider giving a couple of hours of your time to being surrounded by our wonderful quilts while being a tour guide to our visitors. 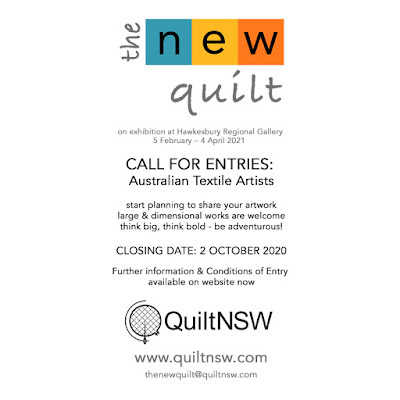 We need lots of people to make up our happy team and you do not need to enter a quilt in the show to volunteer. 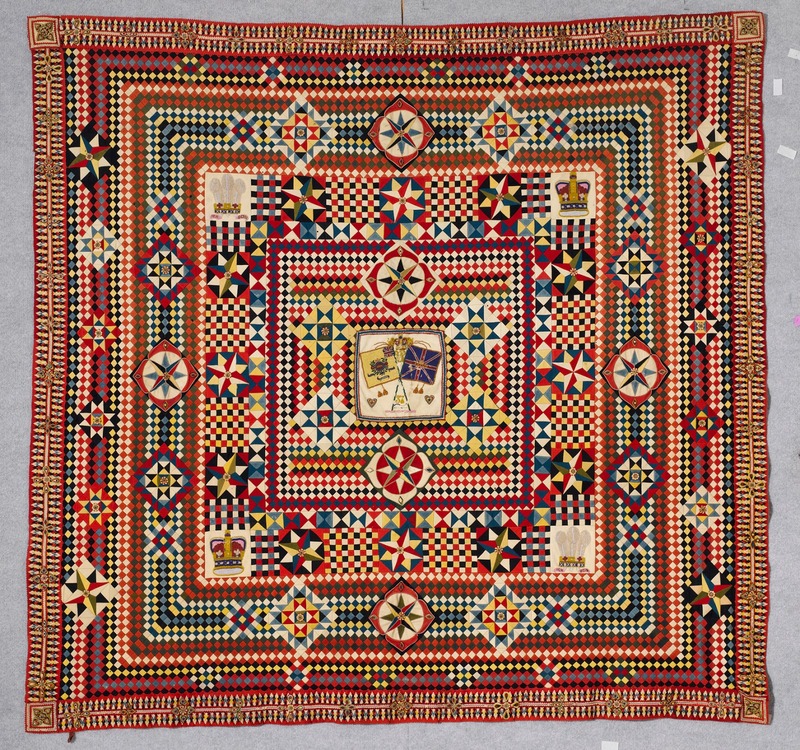 If you have entered a quilt in the Show, it is a requirement that you volunteer for at least two shifts during the exhibition. 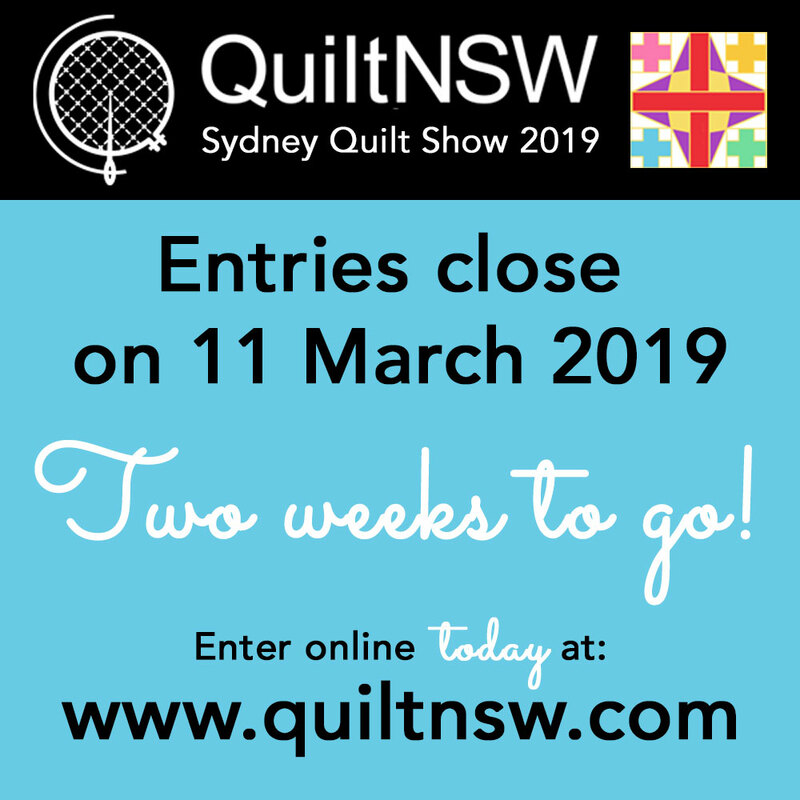 As a thank you, a Volunteer Quilt Show badge will be yours as a reminder of this fantastic event. 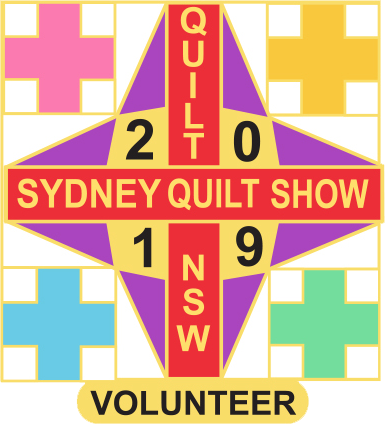 Unfortunately, QuiltNSW cannot supply Craft & Quilt Fair tickets for our volunteers. 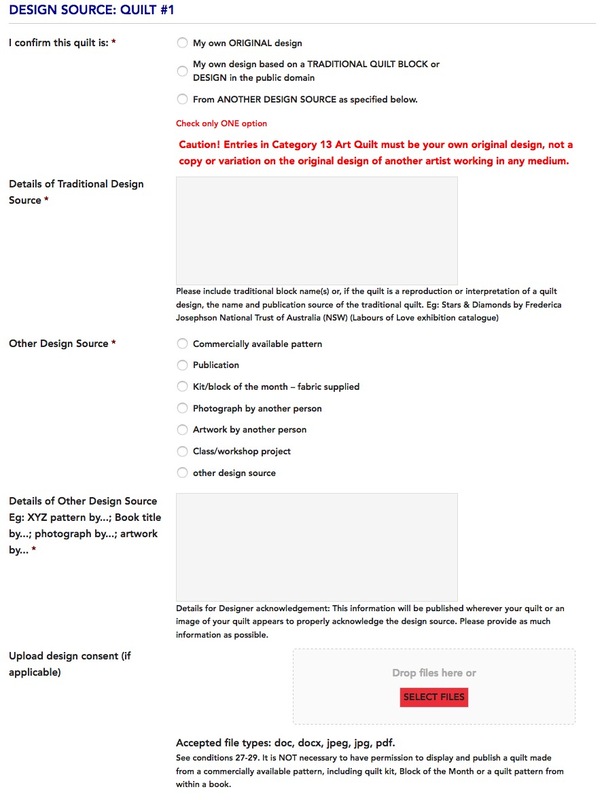 Review the options listed and choose your shifts. Sign up with your e-mail address! It’s easy – you will NOT need to register an account or keep a password on SignUp.com. SignUp.com does not share your email address with anyone and your name and e-mail is not displayed publicly. There is a comment field in the Sign Up form where you can leave notes. Extra assistance is especially welcome for Set Up Day and Take Down. If you are bringing others, please add their names to the comments field that will appear after you have registered for your spot. Sponsorship spots are still available for all tiers - Gold, Silver and Bronze. 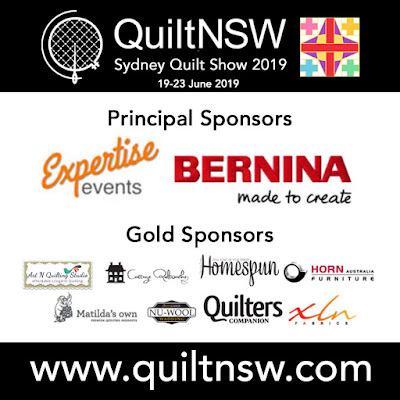 This is an ideal opportunity for businesses to gain exposure to our members and other visitors to the Sydney Quilt Show and the Craft and Quilt Fair. Please contact Sponsorship Manager Kate Rose for more information. 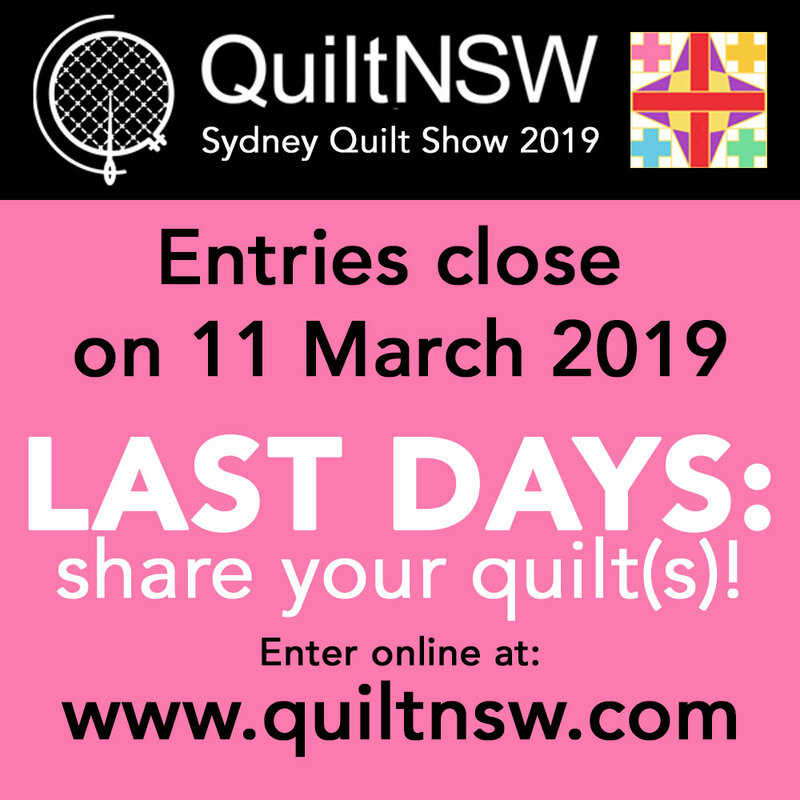 Entries for the Sydney Quilt Show close on Monday 11 March 2019 (midnight). That's soon! 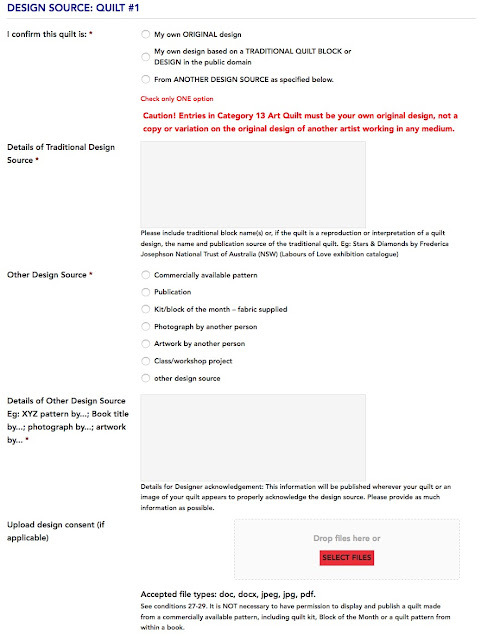 If you don't submit your entry in time, you will miss out! Please don't leave your entry to the last minute. 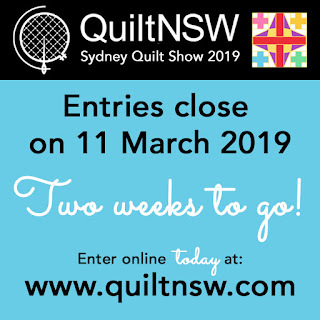 Jump online and submit your entry now so that you know that your entry and payment are received in good time and any technical issues are worked out. If you are lodging a paper entry, it must be physically received in the office by the closing date. Also, to avoid disappointment, if you are entering Entrant's Quilt Top Quilted by Another (Categories 5 and 10), please ensure that your quilter is a current QuiltNSW member as at 11 March.